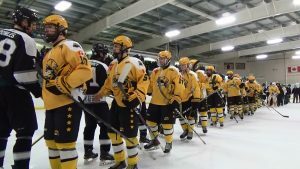 The Uxbridge Bruins battled to the very end at the Bear Den tonight but came up short in a 4-3 loss to the Napanee Raiders. After a scoreless first period the Raiders opened up a 2-0 lead on goals by Reid Humphrey and Liam Mroueh but Tobey Cooper banged home a feed from Daniel Giorgio to get the Bruins within one. In the third Uxbridge tied it on Jackson Savery’s shot in the slot, however the Napanee squad regained the lead on Hunphrey’s second of the game. Midway through the third Captain Aiden Reilly retied the game setting up an exciting finish as Uxbridge pressed to take the lead. With just over a minute left in the third Dayton Kent of the Raiders scored on a 2 on 1 for the game and series clinching goal. Good luck Napanee as you represent the Eastern Conference in the semi-finals. A special thank you to all the players staff and management for a the most successful season in 10 years for the Uxbridge Bruins. Thanks to the Bruins executive who’s tireless efforts keep the Den rolling on Friday nights. To overagers Robert Freckelton, Thomas Sheedy, Ryan McConkey and Captain Aiden Reilly, thanks for your dedication to the team and we wish you all the best in the future. Till next season, c ya!